Here at Bluefish Computer Services we can replace your screen quickly and with the minimal of fuss. Brand new replacement screens cost from less than £60 depending on the make and model and all screens come with a 12 month guarantee. Just Contact Us by email or phone with the make and model of your laptop, or netbook and we can give you an instant quote. We fit screens on all the major laptop makes including Dell, Acer, Toshiba, Sony, HP, Asus, Advent & Fujitsu. 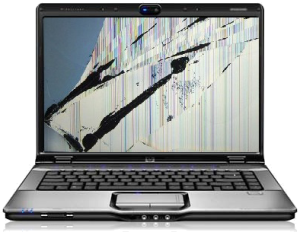 All screen repairs are carried out in our workshop, so there’s no need to send your laptop away for a lengthy repair. If we have the screen in stock we can often replace it the same day, if not we can have the screen delivered the next working day. We even offer a free collect and return service within the Chichester area for your convenience. If you can find a genuine quote cheaper elsewhere not only will we match the price but we will also give you another 10% off.